A new study claims eating an egg a day dramatically raises your risk of a heart attack or a stroke. 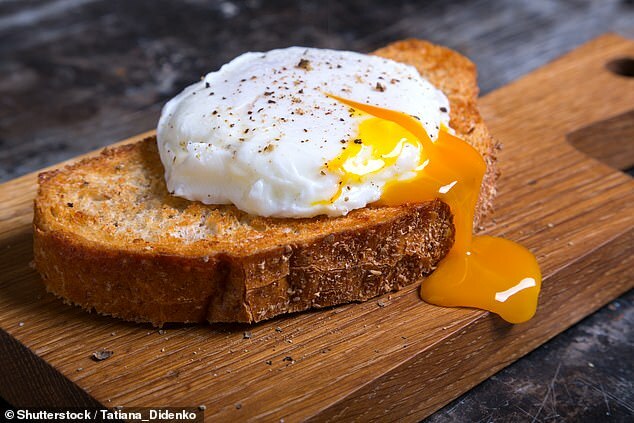 Assessing data on 30,000 people, the researchers found that people with dangerously high cholesterol were more likely to have eggs - crucially: with yolks included - as a stalwart of their diet. But others warn we shouldn't all leap to cut eggs from our diet: there are significant caveats to the study, which is based on old, self-reported data. Experts on all sides largely agree that the study shows we should keep an eye on cholesterol - but it's unclear that cutting out eggs is the best way to do that. A handful of studies have looked into it - and many researchers have done 'reviews' of those same studies - coming up with all kinds of results. The key issue is that nutrition studies are hard to carry out: it is very difficult to control what someone is eating, and to know that they followed your direction - particularly if it is over a long time. But Christopher Labos, MD, a cardiologist at McGill University, told he is less convinced. This was a meta-analysis of six different cohorts summarized together,' Dr Labos said. The biggest issue for Dr Labos - with this and all nutrition studies - is the unreliability of the data. 'You're asking people to remember how many eggs they had over the past month, year, two years, three years,' Dr Labos said. 'How many eggs have you eaten per day over the past two years? Any answer you give me is fundamentally going to be a guess. But there is no guarantee that participants will perfectly follow the rules, so the only way to be certain is to conduct it in a place where all the food is provided direct to the participants - such as in a prison or a hospital. 'For practical reasons and cost, I think it is very unlikely that this would ever happen,' Dr Labos said. 'I don't think this question is important enough that we have to spend $10 million on answering it. 'Does anyone want to invest the time and the money? US dietary guidelines say to consume no more than 300 milligrams of cholesterol a a day. Eggs contain 187 milligrams of cholesterol - and 184 of those milligrams come from the yolk. However, there is a school of thought that says eggs contain 'good' cholesterol (HDL), which carries 'bad' cholesterol (LDL) away from arteries. Plus, eggs come with a good helping of vitamin E.
Dr Labos said: 'It's not eggs, it's more about your overall dietary cholesterol. Whether eggs make much of a difference, it's not clear. 'At the end of the day, it's probably more the cholesterol in your blood than in your food. 'You're better off just eating healthy if you're concerned about cholesterol. 'I wouldn't stress too much about this, I would worry about smoking, exercise, and controlling blood pressure and diabetes.